Last Saturday I went to Bath with the main aim of checking out the Christmas market. It was incredibly crowded, and by the time lunch came I was desperate to escape the festive madness for something more soothing – Japanese food! Since my last visit to Bath I’d had my eye on Yen Sushi on Bartlett Street. The restaurant was crowded and we had to wait to go in, but the service was excellent and the staff were very efficient. 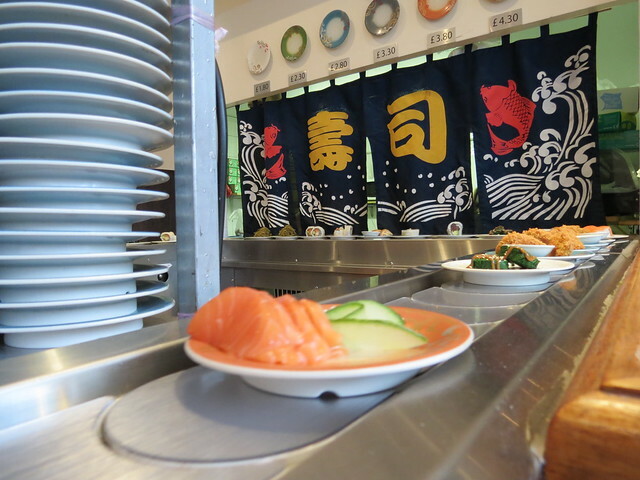 We were seated at the counter – my favourite place to sit, as you get to watch all the sushi go by. Yen Sushi is a ‘kaitenzushi’ (回転寿司) or conveyor belt sushi restaurant, with a tiny space in the middle for the chefs to slice up the sushi, and a busy-looking kitchen behind some ‘noren‘ (暖簾) curtains where bento boxes and other hot dishes were prepared. Naturally, I wanted to eat everything, but I settled for trying one piece of sushi and then having a bento box. If I had not been conscious of how much money I would spend, I would have definitely just eaten sushi off the conveyor belt, as it was really delicious! But with plates ranging from £1.80 to £4.30, that could have been a very expensive lunch (oh how I miss kaitenzushi in Japan where usually each plate is just ￥100 (60p)!). The bento was good – average really, but just what I needed on that particular day. 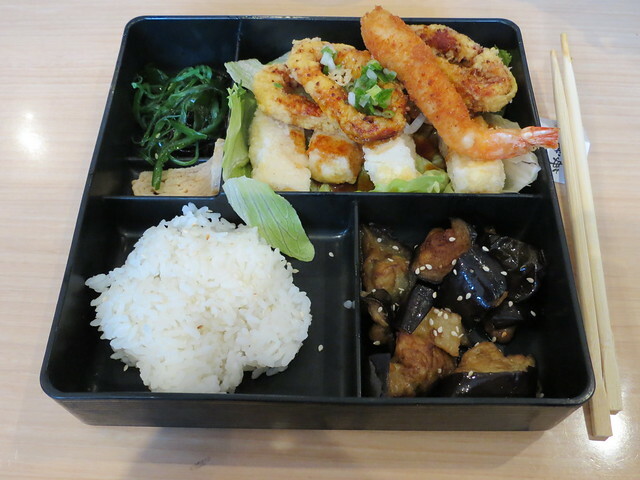 I had the Yen’s Special Bento, which included rice, ebi fry (fried shrimp), calamari rings, tofu steak and salad. The calamari was (surprisingly for me) the best part. 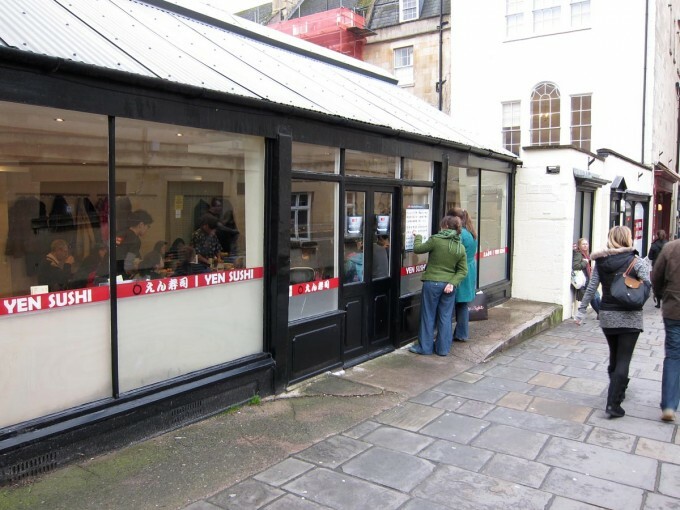 Yen Sushi is the first kaitenzushi restaurant to open in Bath and, if it weren’t for Yo Sushi!, it would be the only one. 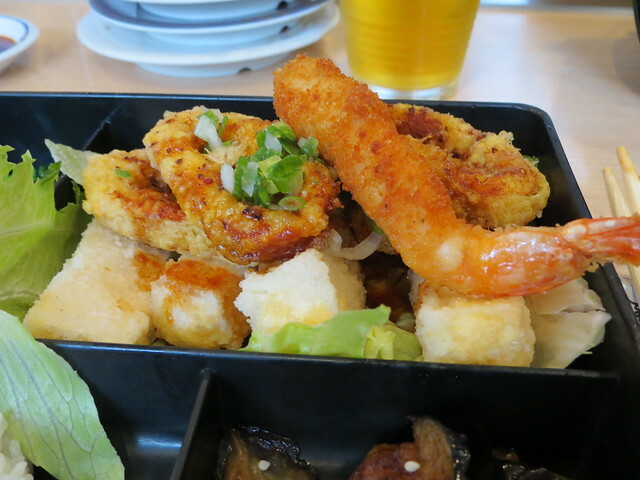 As well as an assortment of different types of sushi (both on the belt and made to order), Yen Sushi also serves bento, ramen, and some other cooked dishes, such as takoyaki, karaage, and chicken wings. They also have a few vegetarian options, which are all clearly labelled on their menu. So, if you’re in Bath and fancy a taste of Japan, head over to Yen Sushi for a really decent lunch or dinner. And, if you’re feeling flush, definitely go for the sushi with a side of calamari!